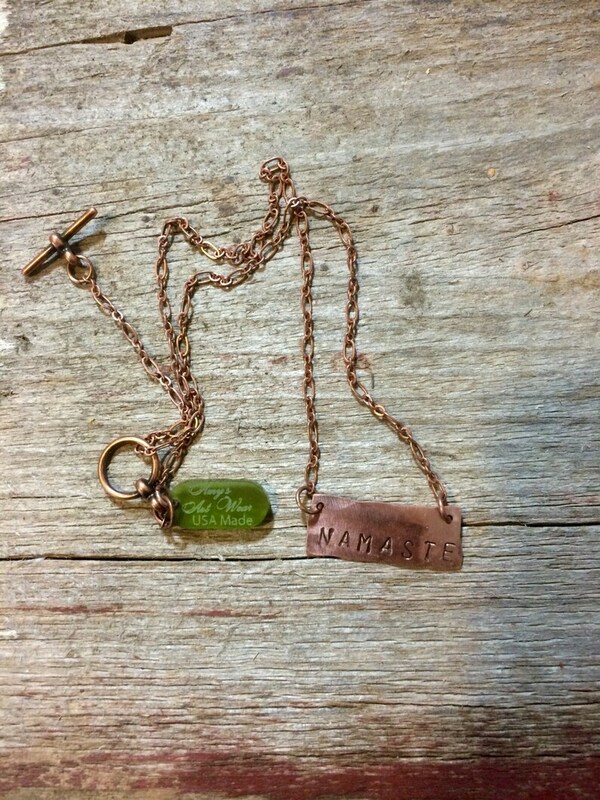 Handmade copper namaste yoga necklace for the yogi in your life. This necklace will fit a neck size of 17in or smaller. ​All designed are created by Amy's Art Wear and come in a box. Checkout my best selling lotus earrings here. Awesome earrings!! Awesome seller!! Will do biz again! I accept payment through PayPal. PayPal accepts all major credit and debit cards without requiring you to have a PayPal account, and is very safe for both buyer and seller. PayPal is secure and very easy to use. **Please note that you do not need a PayPal account to pay via Credit or Debit Card. Once you get to the payments page just click on the PAYPAL button which will then give you the option to pay by Credit Card. Then instead of clicking on the LOG IN button, click on the bold print that says "Pay with Debit, Credit Card or Pay Me Later. For THAT option you DO NOT Need a PAYPAL account. Please note that if you pay by E-Check THROUGH PayPal, PayPal recommends waiting until the E-Check has cleared - which is 3-5 days. I will ship immediately upon notification from PayPal. *I do not cover any damages caused by postal services or regular wear and tear. Defects must be a result of workmanship on My part and not the workmanship of material suppliers. ** Refunds will be given once returned product has been received. Items must be received within 20 days of the original shipping date undamaged. Original shipping costs will not be refunded. Return shipping costs are the responsibility of the customer. I use USPS with Tracking. If you are interested in purchasing wholes sale from me please send me a message. I sell to stores with a minimum opening order of $200.